Hi friends!! So obviously Halloween is around the corner and I still have no idea what I'm being. This is a familiar pattern every year and I find myself, two nights before Halloween, frantically searching ideas on Pinterest that are cute but not too risqué. I found a little inspiration and decided I would hatch up 5 simple Halloween ideas for you guys! I found these all from normal clothes online, so hopefully you could burrow through your closet too and not have to spend so much to try to and recreate these looks. Okay, maybe I'm a little biased because I was a deer last year, but I still think this costume is so darn cute. All you need is brown layers, some antlers, and brown boots! The outfit is simple, but the tricky part might be the makeup. But if I could do it myself, you definitely can too. Plus there are tons of tutorials online that can really help. Gist is for makeup: long, bambi-like lashes, freckles, and a white nose. This is definitely the sexiest look out of all of them, but I think if you're going to a club or going to a crazy party that this could be really fun. If you're not comfortable with a red bodysuit, a white/red tee would go perfectly fine too. Think a little on the military side, add some maryjanes, a fedora, and a whip (you know that one you have just lying around...hahahaha literally a black rope would do fine, or you don't even need a prop if it will get annoying), and you're good to go. 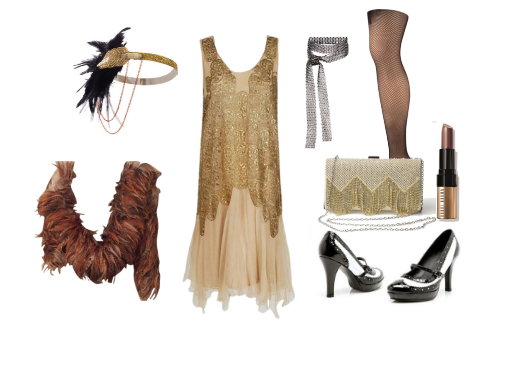 Adding red lipstick and curling your hair might also enhance this costume. When creating this outfit, I got major Gigi x Tommy Hilfiger vibes. I think this would be the easiest look to create out of your own closet and this is also perfect if you want to look apart of Halloween but not too cheesy yet still fashionable. 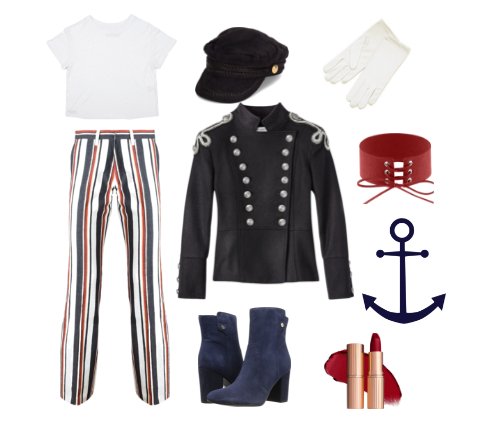 For this look I think the most important pieces are striped trousers, a lieutenant hat, and a military/sailor jacket. The gloves, red lipstick, and choker are just little touches you can add if you want to spice it up. Swap out the pants for striped shorts if you're going to a hot, crowded club. I know this is soooo typical, but if you're literally digging through your draws on Halloween Eve dying for a costume, Mia Wallace from Pulp Fiction is extremely simple to recreate. All you need is black trousers, flats, and a white button up. You don't even need a wig, just tuck your hair (if it's long) and spray it black for a night. Add red lips and a cigarette for a defined look. That's it! I really, really hoped this helped even though I know they are very typical ideas! I decided I just wanted to put my own spin on it and see how I would create these if I had to deal with my own closet/resources. Let me know what you're being this Halloween, or if these looks inspired you! I'd love to hear it.